The results obtained following administration of the Dysfunctional Attitudes Scale, Form A (Hollon & Kendall, 1980) to a Romanian sample are, on the whole, consistent with those obtained in earlier normative studies involving American samples. The scale was administered to a group of 701 adults and teenagers selected from the normal population. Internal consistency coefficients (Alpha Cronbach) ranged from .79 to .86, which are adequate for reporting reliable results. A pilot study examining validity revealed the DAS-A discriminated between groups with extreme scores on different measures of emotional distress. Norms for the Romanian version of the scale are also included. Key words: CBT, dysfunctional attitudes, reliability, validity, norms for the Romanian population. According to DSM IV (2000), clinically depressed people experience extreme feelings of sadness and feel hopeless and helpless weeks on end. Most of the time, they loose interest in the activities they once enjoyed, and have problems sleeping and eating. Many of the persons affected by depression have difficulties concentrating and solving even the simplest of life problems and spend much time contemplating suicide and death. In the severe cases, elaborate plans are made to end one’s life. These symptoms are known to cause major adjustment difficulties that frequently end in life termination. Among the most efficient methods of treating clinical depression are the cognitive-behavior interventions. The central element that differentiates cognitive-behavior therapies from other psychotherapeutic approaches is the cognitive conceptualization of mental problems. A cognitive conceptualization provides the framework for understanding how the patient’s problem developed and is maintained. Cognitive-behavior therapy is based on the cognitive model, which assumes that people’s emotions are caused mainly by the way they interpret and think about life events (Ellis, 1994; Beck, 1995). Aaron Beck’s perspective on clinical depression (Beck, 1967; Beck, Rush, Emery, & Shaw, 1979) is based on the assumption that depressive people hold negatively biased cognitive schemas that filter out positive information, while favoring negative data. A cognitive schema is a knowledge structure that interacts with newer data entries, selectively orienting attention, expectations, memory retrievals and interpretations (Williams, Watts, MacLeod, & Mathews, 1997). Cognitive schemas develop in time, drawing on personal experience and guiding the interpretation of ambiguous situations, as well as the memory encoding and retrieval of emotion-laden information (Williams et al., 1997). While schemas are cognitive structures within the mind, core beliefs are the specific contents of them (Beck, 1964). (1) “All or nothing thinking”- the tendency to view a situation in only two categories, instead of on a continuum; absolutistic thinking. (2) Arbitrary inference – the tendency to draw negative conclusions in the absence of supporting evidence. (3) Selective abstraction – the tendency to pay attention to one negative detail, instead of seeing the big picture. (4) Magnification/minimization – the tendency to unreasonably magnify the negative and/or minimize the positive when evaluating one’s self, another person or a situation. (5) Labeling – the tendency to evaluate oneself or another person globally, ignoring evidence that might support a less extreme conclusion. Dysfunctional attitudes reflect the content of stable cognitive schemas (Beck, Brown, Steer, & Weissman, 1991). Previous studies (Dent & Teasdale, 1988; Marton, Churchard, & Kutcher, 1993; Weich, Churchill, & Lewis, 2003) have showed that dysfunctional attitudes are associated with the presence of depressive symptoms. The Dysfunctional Attitudes Scale (DAS – Weissman, 1979; Weissman & Beck, 1978) is a self-report instrument for assessing attitudes associated with depressive symptoms. Originally a 100-item scale, it was later transformed into two 40-item parallel forms (DAS-A and DAS-B). Using a group of 2.023 psychiatric outpatients diagnosed mainly with affective and anxiety disorders (less than 1.0% were diagnosed with a psychotic disorder), Beck, Brown, Steer and Weissman (1991) examined the factor structure of the original 100-item DAS and found that 66 of the 80 items retained loaded on nine first-order factors. The factors reflected themes of vulnerability, approval, perfectionism, need to please others, imperatives, need to impress others, avoidance of weakness, control over emotions, and disapproval. The factor solution was stable on cross-validation and invariant with respect to gender. Factor analyses performed on the two 40-item parallel forms revealed different structures, for different target populations. For example, Cane, Olinger, Gotlib and Kuiper (1986) factor analyzed form A of DAS using a non-clinical group of 664 students and found just two factors, which they named “performance evaluation” and “approval by others”. A year earlier, in 1985, Oliver and Baumgart have administered both forms of DAS (A and B) to a group of 275 persons formed by hospital workers and their spouses and found a lack of factorial equivalence between the two forms. In 1984, Parker, Bradshaw and Blignault had administered DAS-A and DAS-B to two samples of Australian general practice patients (N = 117 and 126) and found four factors, which they named “Externalized Self-Esteem”, “Anaclitic Self-Esteem”, “Tentativeness”, and “Need for Approval”. Results obtained with samples of older adults indicate the factor structure established with younger adults does not replicate with this age group. Moreover, the factor structure with older adults seems to be uncertain: a single factor structure, two-factor structure, and three-factor structure are essentially of equal validity (Floyd, Scogin, & Chaplin, 2004). While the factor structure of DAS-A and DAS-B remains uncertain, pending future investigation, reliability coefficients (Alpha Cronbach = .89) are good (Weissman & Beck, 1978), as well as the correlation between the two forms (r=.81). All things considered, DAS-A is one of the most efficient instruments for measuring the cognitive distortions associated with clinical depression. The purpose of the present study is to offer a first translation of the scale and preliminary data for the Romanian population, the comprehensive investigation of the psychometric properties of the Romanian version being an objective for future studies. Implications and limits of the present study are discussed in the “Discussion” section. The 40 items of DAS-A are phrased as statements usually underlying depressive idiosyncratic thinking. Each item elicits information on the individual’s dysfunctional beliefs, which act as schemas used to construct the world (Weissman & Beck, 1978). Ten items are phrased in a functional way, while the other 30 represent dysfunctional attitudes. For example, item 4 “If I do not do well all the time, people will not respect me” represents a dysfunctional attitude; at the same time, item 2 “Happiness is more a matter of my attitude towards myself then the way other people feel about me” represents adaptive thinking. DAS-A score indicates the extent to which dysfunctional attitudes are characteristic of a person’s thinking; the higher the score, the more dysfunctional the subject’s attitudes. The scale is a paper and pencil assessment instrument, which can be administered both individually and collectively. In case of group administration, it is recommended the groups do not exceed 15 persons; however, individual testing is the method of choice whenever possible. When – due to special circumstances – groups exceed 15 persons, the number of evaluators must increase so as there is at least one evaluator for every 15 persons. Materials needed for the scale administration include the 40 items along with instructions and writing tools. Testing environment has to be secure and noise free, properly furnished and illuminated so as to provide optimal testing conditions. The subject has to be adequately motivated and in good physical and mental condition. The DAS-A score is calculated by summing up the individual scores for the 40 items of the test. Every item of the DAS-A is scored from 1 to 7. Depending on the content, either „Totally agree”, or „Totally disagree” will be the anchor point. The other 30 items are scored in the reversed direction, so that 1 = “Totally disagree”, while 7 = “Totally agree”. The highest possible score is 280 (7×40 items), while the lowest possible score is 40 (1×40 items). The higher the score, the more dysfunctional the subject’s attitudes. Omits will be coded as zero (missing data). However, if the individual omits a large proportion of the items, the test should be ignored. A total of 701 subjects volunteered to participate in the study developed to assess the psychometric properties of the Romanian version of the DAS-A. University students participated in exchange for course credits, while the other subjects were selected from the respondents to public announcements. All subjects were properly informed about test procedure, use of data and confidentiality. For the underage subjects, a parent or legal guardian had to provide agreement. Because some of the subjects failed to provide data concerning gender, educational level, age, and marital status, descriptive statistics reported below will reflect these missing data. Tables 1- 4. Descriptive statistics for subjects included in study. Beck Depression Inventory (Beck, Rush, Shaw, & Emery, 1979) was used as a measure of current depressive symptoms. BDI is a 21-item self-report measure of depression, with excellent psychometric properties (high internal consistency, retest reliability and convergent validity), as well as sensitiveness to clinical change (Beck, Steer, & Garbin, 1988). Attitudes and Beliefs Scale 2 (DiGiuseppe, Leaf, Exner, & Robin, 1988) was used as a measure of irrational beliefs. ABS2 is a 72-item scale consisting of a 4x3x2 matrix. The first factor consists of belief processes and has four levels representing demandingness (DEM), self-worth or self-downing (SD), low frustration tolerance (LFT) and awfulizing (AWF). The second factor includes content/context information and has three levels representing beliefs about affiliation, achievement and comfort. The third factor determines if the item is worded rationally or irrationally. Therefore, the scale allows the discrete evaluation of irrationality, rationality, demandingness, self-downing, frustration tolerance and awfulizing. The scale is a valid measure of the four irrational beliefs central to rational emotive behavior therapy/theory (REBT). It has high internal consistency and discriminative validity for both American (DiGiuseppe, Robin, Leaf, & Gormon, 1989) and Romanian populations (Macavei, 2002). Unconditional Self-Acceptance Questionnaire (Chamberlain & Haaga, 2001) is a 20-item self-report instrument that measures unconditional acceptance of self. It is based on Albert Ellis’s theory of personal acceptance, the items reflecting different aspects of this complex concept. The questionnaire allows for the calculation of a global score, with high values expressing unconditional self-acceptance, and low values expressing conditional acceptance of one’s personal worth. Empirical data (Chamberlain & Haaga, 2001; David, Schnur & Belloiu, 2002) suggest unconditional self-acceptance is a protective factor against emotional distress when facing negative life events. Profile of Emotional Distress (PED) is a 26-item self-report scale that measures functional and dysfunctional negative emotions, falling into depression/sadness and anxiety/concern categories. The scale was constructed by Opris and Macavei (2005) based on the Profile of Mood States, Short Version (DiLorenzo, Bovbjerg, Montgomery, Valdimarsdottir, & Jacobsen, 1999) and Albert Ellis’s theory of emotional distress (Ellis, 1994) and has good psychometric properties (Opris & Macavei, in press). The scale allows for the calculation of a global score of distress, as well as discrete scores for functional emotions, dysfunctional emotions, anxiety, depression, concern and sadness. Profile of Mood States-Short Version (POMS-SV) is a 47-item instrument that measures transient levels of distress. This is a short version (Shacham 1983) of the classic mood adjective checklist (McNair, Lorr, & Droppelman, 1971) that allows for the assessment of six affective dimensions and provides a total distress score. Test-retest reliability for each of the subscales have been found to be consistent with the long version, and have been demonstrated to have good criterion validity (DiLorenzo, Bovbjerg, Montgomery, Valdimarsdottir, & Jacobsen, 1999). Automatic Thoughts Questionnaire is a 30-item self-report measure of depression related automatic thoughts, elaborated in 1980 by Hollon and Kendall. It consists of statements reflecting idiosyncratic depressive thinking (Beck, 1976, Beck, 1995). After giving an informed consent, participants were interviewed and tested individually; persons under 18 years of age were allowed to participate following consent of a parent or legal guardian. They participated in an assessment interview, during which the tests and scales were administered. Measures were administered without time limit, in random order, to control for any application order effects. The interviews were conducted by licensed psychologists. All participants were debriefed and the ones in need of counseling or psychotherapy were offered low-cost therapy referrals. Results obtained using a non-clinical group of 701 adult subjects indicate there is no significant difference between groups according to gender (t = 2.30, p > .05). Norms were developed using five normal classes, (the corresponding percentages are 6.7%, 24.2%, 38,2%, 24.2%, 6.7%). Thus, the first class includes 6.7% of subjects, those with the lowest level of dysfunctional attitudes. The fifth class also includes 6.7% of subjects, those with the highest level of dysfunctional attitudes. Because there is no significant difference between groups according to gender (t = 2.30, p> .05), same norms were elaborated for men and women. Table 5. Descriptive statistics for DAS-A. Table 6. Norms for the Romanian version of DAS-A. Reliability of a psychological instrument reflects the extent to which all items refer to the same construct. Reliability is most often expressed based on internal consistency coefficients and score stability in time (Anastasi, 1988). While the factor structure of DAS-A and DAS-B remains uncertain pending future investigation, reliability coefficients for the English version (Alpha Cronbach = .89) are good (Weissman & Beck, 1978). For the Romanian version of DAS-A internal consistency was assessed using 682 subjects. Alpha Cronbach coefficient was .86, which indicates all items express the same construct described by A. Beck (1976) – dysfunctional attitudes associated with depression. Table 7. Descriptive statistics and Alpha Cronbach coefficients for DAS-A, according to gender. * The difference between N-combined and the sum of N-female and N-male is given by the missing date on gender for some of the subjects. The 40 items of DAS-A come from a 100-item pool, which served to the elaboration of two 40-item parallel forms of DAS (A and B) (Beck, Brown, Steer & Weissman 1991). In order to assess discriminative validity of DAS-A, three sets of extreme score groups were created based on (1) Profile of Emotional Distress global score, (2) Profile of Mood State-SV global score, and (3) Profile of Emotional Distress, depression subscore. Extreme scores groups were generated by adding and subtracting 1 S.D. to and from the mean score of each test. The “medium” group includes all values between the two extremes. Table 8. Descriptive statistics for the tests used to generate extreme score groups. For all three measures of emotional distress mentioned above, differences between extreme groups were significant (see Table 9). Although the extreme groups have relatively few subjects, results represent an argument for the ability of DAS-A Romanian version to discriminate between subjects with high and low levels of negative emotions. Table 9. Comparisons among extreme groups for three measures of emotional distress. The Romania version of the DAS-A also correlates positively with other measures of dysfunctional thinking (e.g., Automatic Thoughts Questionnaire, Attitudes and Beliefs Scale 2), and negatively with unconditional self-acceptance (Unconditional self-acceptance questionnaire) (Table 10). At the same time, results indicate a positive association between dysfunctional attitudes and negative affect and a negative association between dysfunctional attitudes and positive affect (Table 10). These preliminary results should encourage future studies into the psychometric properties of DAS-A. Table 10. Correlations (r-Pearson) between DAs-A score and the scores for other measures of dysfunctional/functional thinking and affect. The growing interest in cognitive-behavior theory and method Romanian mental health professionals and clients have expressed during the last years has encouraged us to try to make available yet another instrument to be used in research and practice. At the core of all cognitive-behavior therapies lies the assumption that our maladaptive emotions and behaviors are caused by the endorsement of dysfunctional attitudes and beliefs. In an attempt to identify cognitions directly responsible for our reactions, different professionals stressed either the role of cold cognitions (schemas and automatic thoughts – Beck, 1976; Beck, 1995), or hot cognitions (evaluations – Ellis, 1994, Lazarus, 1991). Fortunately, recently some avant-garde CBT professionals have begun to point out the need to investigate and clarify the relation between cold and hot cognitions and the way they interact to cause emotional and behavioral consequences (David et al., 2002; David, 2006). Along with ABS2 (Macavei, 2002), we hope the Romanian version of DAS-A constitutes a useful working instrument for all interested. Because time and resources did not allow for a comprehensive evaluation of Romanian version of DAS-A properties, data offered in this article should be used cautiously, pending future investigations. Anastasi, A. (1988). Psychological Testing. 6th edition. New York: Macmillan. APsyA (2000). Diagnostic and statistical manual of mental disorders (fourth edition revised). American Psychiatric Association: Washington. Beck, A.T. (1964). Thinking and depression: Theory and therapy. Archives of General Psychiatry, 10, 561-571. Beck, A.T. (1967). Depression: Causes and treatment. Philadelphia: University of Pennsylvania Press. Beck, A.T. (1976). Cognitive therapy and the emotional disorders. New York, NY: Penguin Books. Beck, A.T. (1976). Cognitive therapy for emotional disorders. International New York: University Press. Beck, A.T. (1987). Cognitive models of depression. The Journal of Cognitive Psychotherapy: An International Quarterly, 1, 5-37. Beck, A.T., Brown, G., Steer, R.A., & Weissman, A.N. (1991). Factor Analysis of the Dysfunctional Attitude Scale in a Clinical Population. Psychological Assessment: A Journal of Consulting and Clinical Psychology, 3, 478-483. Beck, A.T., Steer, R., & Garbin, M. (1988). Psychometric properties of the Beck Depression Inventory: Twenty-five years of evaluation. Clinical Psychology Review, 8, 77-100.
and beyond. New York: Guilford Press. Beck, A.T., Rush, A.J., Shaw, B.F., & Emery, G. (1979). Cognitive therapy of depression. New York: Guilford Press. Cane, D.B., Olinger, L.J., Gotlib, I.H., & Kuiper, N.A. (1986). Factor structure of the Dysfunctional Attitude Scale in a student population. Journal of Clinical Psychology, 42, 307-309. Chamberlain, J.M., & Haaga, D.A.F. (2001). Unconditional self-acceptance and psychological health. Journal of Rational-Emotive & Cognitive-Behavior Therapy, 19, 163-176. David, D. (2006). Metodologia cercetării clinice. Fundamente. Iaşi: Editura Polirom. David, D., Schnur J., & Belloiu, A. (2002). Another search for the “hot” cognitions: Appraisal, irrational beliefs, attributions, and their relation to emotion. Journal of Rational-Emotive and Cognitive-Behavior Therapy, 2, 93-131. DiGiuseppe, R., Robin, M.W., Leaf, R. & Gormon, B. (1989). A discriminative validation and factor analysis of a measure of rational /irrational beliefs. Paper presented at the World Congress of Cognitive Therapy, Oxford, UK. DiLorenzo, T., Bovbjerg, D., Montgomery, G., Valdimarsdottir, H., & Jacobsen, P. (1999) The application of a shortened version of the profile of mood states in a sample of breast cancer chemotherapy patients. British Journal of Health Psychology, 4, 315-325. Ellis, A. (1994). Reason and emotion in psychotherapy. New York: Carol Publishing Group. Floyd, M., Scogin, F., & Chaplin, W.F. (2004). The Dysfunctional Attitudes Scale: factor structure, reliability, and validity with older adults. Aging &Mental Health, 8, 153 -160. Hollon, S.D., & Kendall, P.C. (1980). Cognitive self-statements in depression: Development of an automatic thoughts questionnaire. Cognitive Therapy and Research, 4, 383-395. Lazarus, R.S. (1991). Emotion and adaptation. Oxford University Press: New York. Macavei, B. (2002). A Romania adaptation of the Attitudes and Beliefs Scale 2. Romanian Journal of Cognitive and Behavioral Psychotherapies, 2, 105-122. Marton, P., Churchard, M., & Kutcher, S. (1993). Cognitive Distortion in Depressed Adolescents. Journal of Psychiatric Neuroscience, 18, 103-107. McNair, D., Lorr, M., & Droppelman, L. (1971) Manual: Profile of Mood States. San Diego, CA: DITS/Educational and Industrial Testing Service, Inc.
Oliver, J.M., & Baumgart, E.P. (1985). The Dysfunctional Attitude Scale: Psychometric properties and relation to depression in an unselected adult population. Cognitive Therapy and Research, 9, 161-167. Opris, D., & Macavei, B. (2005). The distinction between functional and dysfunctional negative emotions; An empirical analysis. Journal of Cognitive and Behavioral Psychotherapies, 5, 181-195. Opris, D., & Macavei, B. (2007). The Profile of Emotional Distress; Norms for the Romanian Population. 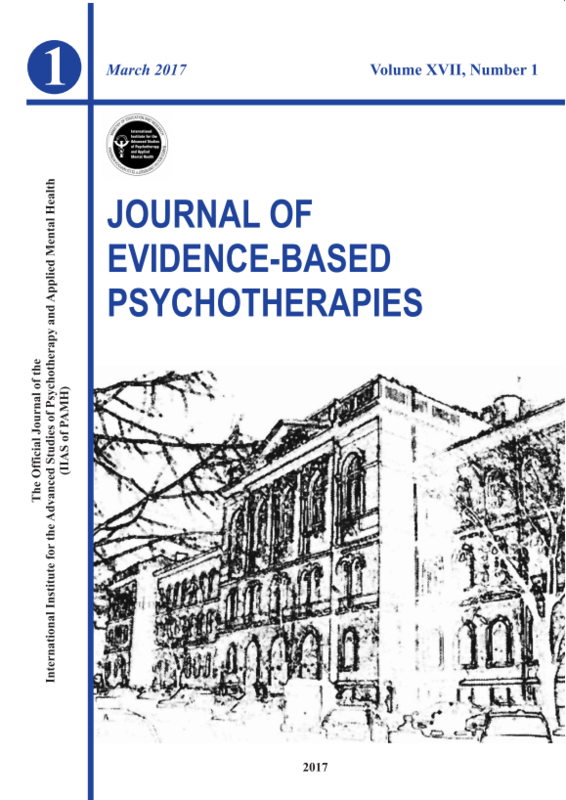 Journal of Cognitive and Behavioral Psychotherapies, in press. Parker, G., Bradshaw, G., & Blignault, I. (1984). Dysfunctional attitudes: Measurement, significant constructs and links with depression. Acta Psychiatrica Scandinavica, 70, 90-96. Shacham, N. (1983) A shortened version of the profile of mood states. Journal of Personality Assessment, 47, 305-306. Weich, S., Churchill, R., & Lewis, G. (2003). Dysfunctional attitudes and the common mental disorders in primary care. Journal of Affective Disorders, 75, 269-278. Weissman, A.N. (1979). The Dysfunctional Attitude Scale: A validation study. Dissertation Abstracts International, 40, 1389B-1390B. (University Microfilms No. 79-19, 533). Weissman, A.N., & Beck, A.T. (1978, November). Development and validation of the Dysfunctional Attitude Scale : A preliminary investigation. Paper presented at the meeting of the Association for the Advancement of Behavior Therapy, Chicago. Williams, J.M.G., Watts, F.N., MacLeod, C., & Mathews, A. (1997). Cognitive Psychology and Emotional Disorders. Chichester, England: Wiley. This inventory lists different attitudes or beliefs which people sometimes hold. Read each statement carefully and decide how much you agree or disagree with the statement. For each of the attitudes, show your answer by using the number code given below that best describes what you think. Be sure to choose only one number for each attitude. Because people are different, there is no right or wrong answer to these statements. To decide whether a given attitude is typical of your way of looking at things, simply keep in mind what you are like most of the time. Remember, answer each statement according to the way you think most of the time. It is difficult to be happy unless one is good looking, intelligent, rich and creative. Happiness is more a matter of my attitude towards myself then the way other people feel about me. People will probably think less of me if I make a mistake. If I do not do well all the time, people will not respect me. Taking even a small risk is foolish because the loss is likely to be a disaster. It is possible to gain another person’s respect, without being especially talented at anything. I cannot be happy unless most people I know admire me. If a person asks for help, it is a sign of weakness. If I do not do as well as other people, it means I am an inferior human being. If I fail at my work, then I am a failure as a person. If you cannot do something well, there is little point in doing it at all. Making mistakes is fine because I can learn from them. If someone disagrees with me, it probably indicates he/she does not like me. If I fail partly, it is as bad as being a complete failure. If other people know what you are really like, they will think less of you. I am nothing if a person I love does not love me. One can get pleasure from an activity regardless of the end result. People should have a reasonable likelihood of success before undertaking anything. My value as a person depends greatly on what others think of me. If I don ‘t set the highest standards for myself, I am likely to end up a second-rate person. If I am to be a worthwhile person, I must be truly outstanding in at least one major respect. People who have good ideas are more worthy than those who do not. I should be upset if I make a mistake. My own opinions of myself are more important than others’ opinions of me. To be a good, moral, worthwhile person, I must help everyone who needs it. If I ask a question, it makes me look inferior. It is awful to be disapproved of by people important to you. If you don ‘t have other people to lean on, you are bound to be sad. I can reach important goals without slave driving myself. It is possible for a person to be scolded and not get upset. I cannot trust other people because they might be cruel to me. If others dislike you, you cannot be happy. It is best to give up your own interests in order to please other people. My happiness depends more on other people than it does on me. I do not need the approval of other people in order to be happy. If a person avoids problems, the problems tend to go away. I can be happy even if I miss out on many of the good things in life. What other people think about me is very important. Being isolated from others is bound to lead to unhappiness. I can find happiness without being loved by another person. * DAS-A items adapted and reprinted with permission from Aaron T. Beck, MD.